As you round the headland from Phuket Island between Phi Phi Don and Phi Phi Ley Islands or arrive from Krabi rounding Shark Point you get the impression of entering a special part of the world. The cliffs of Tonsai through to the golden sands of Long Beach creates an awe inspiring spectacle. Many of the passengers of the daily move to the side of the ferries and even the bigger ferries list a degree or two. Tonsai Bay stretches along a 2km wall of cliffs round to the main village which is a 2 km wide beach, which as it heads east is interrupted with headlands and smaller beaches. This bay is the dominant bay where the ferries arrive as it is the main deep water entrance to the island. 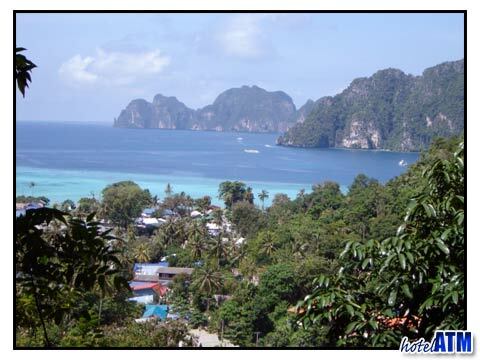 The main Phi Phi Don village is often referred to as Tonsai Village by the people who live there. Tonsai Beach has white gleaming sand that stretches along the palm thronged shoreline. This is the ideal place to relax and watch the day go by which many do on the neatly rowed deckchairs at the Phi Phi Cabana Hotel or just past the hospital at Arida. If that is not enough you can take a dip in the clear blue aqua marine sea at a glorious 29 degrees centigrade. If you feel more adventurous you can stroll down to the reef at the western edge of the bay and snorkel to see a vast array of near shore marine life. If you doing a PADI or SSI diving course in the village you might well be asked to do training in the confined waters that has a perfect sandy bottom just in front of the Phi Phi Cabana Hotel. Here the roped off waters give ideal conditions to practice equipment drills, underwater signs and show swimming ability to the instructors. This bustling community of local Muslim, Thai trader, and western diver, traveler and holiday maker create a rich and colourful spectacle. 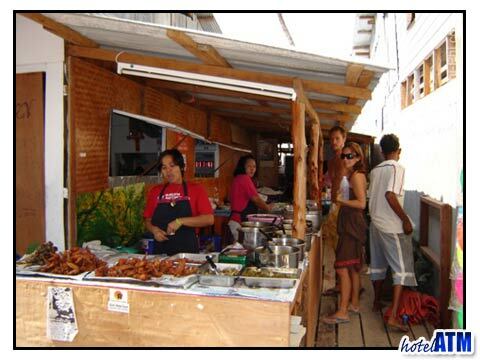 This is the heart of the islands where the Asian bazaar like village is noisy, exciting and fun, where there are many hotels and resort, a wide nightlife scene and some of the best restaurants on the island. Stay in a comfortable 3 story hotel like the Phi Phi Hotel, dive at Sea Frog Divers, eat at the renowned Le Grand Blue, stay connected at Siam UK Travel and Tours Internet cafe, buy a painting at the art gallery, eat local spicy curries, organize Shark watching tours at the Adventure Club, get a Tattoo, watch the fire show at Hippies, watch the nightly Thai Boxing at the Reggae Bar shop till you drop and much much more... this is a wonderful place to visit. With the sea dropping like a stone from the edge of the cliffs it is a natural deep water harbour. Protected from the worst winds of low season and while the seas can have 5 meter waves off shore, the Tonsai Bay stays flat as a pancake. This has given rise to an all year water sports haven. It is so deep that one of the more wild tours on Phi Phi Island is cliff jumping. I’ve seen some dare devils leap 12 meters off the cliffs. They all bobbed to the surface with a huge grin. This is ideal for the thrill seeker. Diving is often done in Tonsai Bay in the low season as there are very beautiful reefs under the cliffs and also a 30 m rock called Hin Dot just off the end of Tonsai Cliffs. One of my favourite kayaking tours takes place under the cliffs at the end of the day. To see the Brahmin Raptors soaring over the bay at early evening, to paddle over the coral reef, to hear the dance of the jungle…. now that’s my type of living. You can hire kayaks down by the beach. Many of the speedboat tours to Phi Phi Island will drop on in Tonsai Bay, many to have a bite to eat under the coconut trees, just to take in this magnificent bay.